So after updating to 10.5.3 I fired up Address Book and looked at the preferences but the Google Sync option at the bottom was missing. I did a little research and apparently this is only an option if you have an iPhone or iPod Touch that’s been hooked to your Mac. I’d love an iPhone but I don’t have one so apparently the option is not available to me. I don’t really understand the logic behind that one. A note to the Google folks that run that blog: perhaps you should update your article to reflect that this only works if you have an iPhone or iPod Touch? Lifehacker (an outstanding site) has a hack that is supposed to get it working on Macs that are not tethered to an iPhone or Touch. Turns out there are some problems with using that method based on the comments under the article though so I held off on trying it myself. 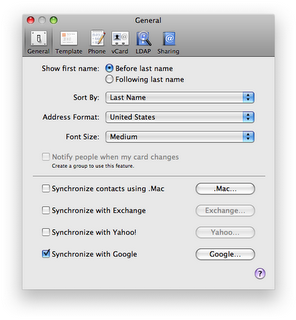 Do I really want to sync with Google Contacts anyway? While going through and trying to figure out if I wanted to make this work I started thinking through how my Google Contact list is used compared to my address book. Gmail automatically adds every person you send an e-mail to into your Contacts list – there is no option to turn that off. I was once asked to send an e-mail out to the parents of my son’s football team – a list that had over 90 people on it I don’t communicate with often at all – yet all of them are now parked in my Contact list. Until Google gives me the option in Gmail to not auto-add every single person into my address book I don’t see the value in it. My address book will be populated with hundreds of people that I don’t even have a name or phone number for, just a cryptic e-mail address. For once I’m really glad I found a feature that didn’t work. the auto-add function in gmail not being optional is not a problem. what we need is a serious update to the contact list. then isync does not sync contacts to your phone that don’t have a phone number (option). so, at least your phone gets only the contact you need. while your computer stores the world.